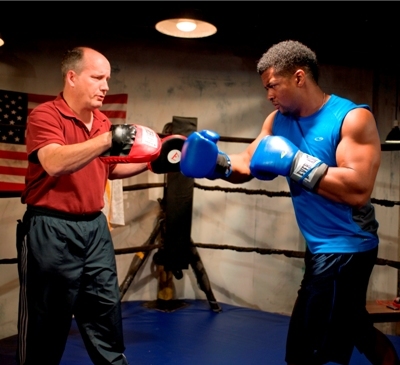 Interview: Actor says learning to bob and weave on streets of Peoria prepped him for part as fighter in Brett Neveu’s play at A Red Orchid Theatre. Through Dec. 15. A round of boxing lasts three minutes. 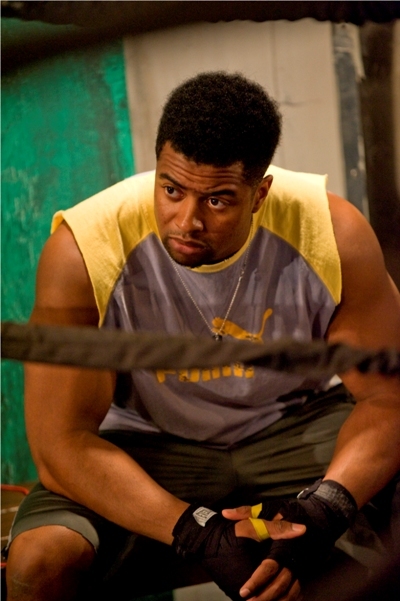 That’s about how long it takes Kamal Angelo Bolden, as a spunky young boxer who’s all speed and dreams in Brett Neveu’s “The Opponent,” to redefine the phrase “physical theater.” But Bolden says his knockout performance in the ring at A Red Orchid Theatre was the easy part. The challenge was getting the dreamer right. In his infectious performance, Bolden has all the moves both physically — he’s in well-muscled shape – and emotionally as the cocky, optimistic but untested kid being groomed by an ex-fighter played by Guy Van Swearingen. Before the clouds of conflict start to gather, it’s great fun just watching this handsome Ali-like fighter practice his punches with the trainer and blaze through exercises with the skip-rope. Bolden says fight choreographer John Tovar designed the ring sequences “to look 90 percent authentic. The other 10 percent is for the actors’ safety. The play is also written in such a way that credibility is in the text. There’s a lot of boxing jargon, similar to the way the cops talk in the TV series ‘The Wire.’ That adds a lot to the story’s realism. We don’t try to explain the language, the references, the terms. You just go with it. “Donel (the fighter) is the consummate dreamer. He has grown up without many chances to be someone and have something in the world. But on television he has seen people, boxers, who have these things. He sees that he can get on top of the world with his fists. He can have the beautiful wife, cars, a house, jewelry. After his large-cast ensemble work in the Court Theatre production of August Wilson’s “Jitney” earlier this season, Bolden says he welcomed the concentrated demands of Neveu’s play. The actor credits director Karen Kessler with releasing the compressed energy of Neveu’s laconic script. “Karen dug into the spaces, filled in the blanks. She knows boxing. She knows sports. At the first rehearsal she brought up Game 5 of the Bulls-Knicks championship series from the ‘90s. She talked about it in so much detail I knew she had watched it. I was blown away. And she brought an intense knowledge of boxing. She knew Mike Tyson’s back story, which most people don’t. “It’s important to have a director who knows so much more than the actors, and Karen honestly did. She bridged the boxing and the humanity of the play. The actor who saw himself as Michael Jordan: Visit Kamal Angelo Bolden’s website.